The real estate sector had a difficult 2018, though from a sector-investing basis it was not as bad as one might have expected. While the S&P 500 was down 4.38% on a total-return basis, the real estate sector was off 2.2%. However, one of the largest real estate ETFs, Vanguard’s VNQ, was down 5.9%. VNQ has the bulk of its holdings in different categories of REITs. “Science fiction writer William Gibson once said ‘the future is here—it’s just not evenly distributed.’ The same could be said for the affordability and availability of housing in 2018. It existed—just not everywhere. 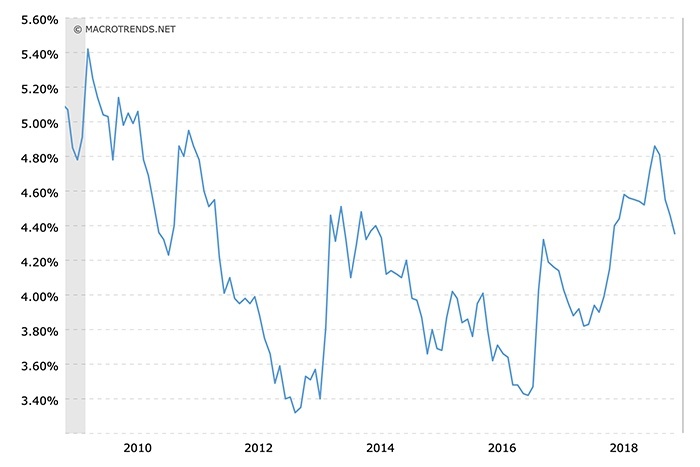 With the Federal Reserve indicating in early January that the likelihood for further rate increases in 2019 had diminished, mortgage rates have continued to back off from the peak of 2018. “Low interest rates: Low rates have enabled real estate investors to buy property with relatively ‘cheap’ money, which provides the potential for greater income. “Expanding economy: An expanding U.S. economy typically helps the real estate area, as rental rates increase for apartments, retail and office buildings. “Based on pricing in the futures markets, there is now a 60.4% chance that the Fed sits on its hands between now and the meeting next January (2020). “The odds of a rate cut have actually shot higher this week, rising to just under 40%. The outlook for the residential market for 2019, according to National Association of Realtors’ (NAR) chief economist Lawrence Yun is for “more of the same, in terms of growth” versus 2018. His outlook calls for combined existing and new home sales “to increase a little less than 1 percent, from 5.97 million to 6.1 million.” There will be disparity between geographic markets and between lower-priced and high-end homes, with demand for more affordable housing being strong. The sales of more-expensive homes are going to suffer on a relative basis from higher inventory and the impact of changes in the tax law, which caps mortgage interest deductions and state and local tax deductions. The homebuilders’ monthly confidence index was unchanged at a seasonally adjusted reading of 62 in March, according to the release on Monday of the NAHB/Wells Fargo Housing Market Index. While this was somewhat disappointing, the index has rebounded over the past three months from a reading of 56 in December. 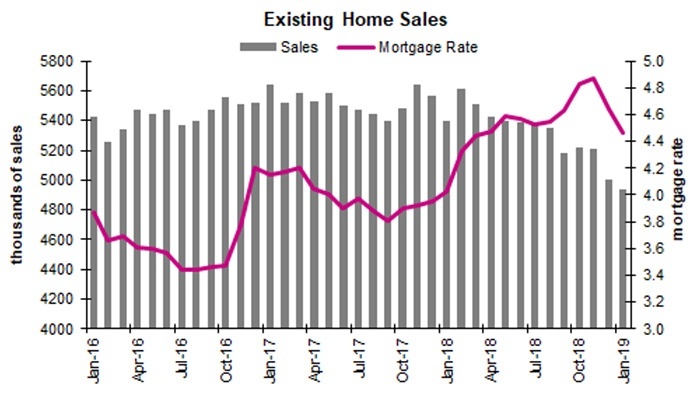 Existing home sales for January, however, fell for the third straight month and “hit a 3-year low,” according to MarketWatch’s analysis from late February. The picture, therefore, remains very mixed for the housing market.